You are currently browsing the The Indie Credential weblog archives for June, 2006. News: Art Brut Top of the Pops! Thanks to Popcult for pointing out the Drowned in Sound article about a petition to get Art Brut on the last ever Top of the Pops. We reckon it’s a brilliant idea and a perfect way to end the show. So please go sign the petition. Okay, word of warning, a rant is about to ensue, so prepare to be bored quickly or irritated by the following opinion. But please, do respond because I’d like some perspective from others on this issue. Now, I’ve never been one to get worked up about the whole issue of the indie sell-out. I can understand a band signing to a major label to get more exposure. As artists I would think the whole point for a band would be to get their music to as many people as possible, as long as they can do it without compromising their creative vision. I cringed not when the likes of The Decemberists and Death Cab for Cutie signed to major labels as their following had outgrown the ability of their respective indies to promote them to an ever-growing audience. So fair dues to them. I hope both bands are able to maintain the same standard of output and sell a million records. I do. Now again, I do cringe whenever I hear a song I like in an ad. Joanna Newsom advertising mobile phones, The Cure backtracking a car advert. It’s hideous. It truly is. But for all I know Joanna Newsom uses that network or some member of the Cure bought a child or a relative that car. If they have never said they detest the idea of using their music as advertisement then as much as I dislike it, at least it’s not hypocrisy. I’d hate to think, however, that any musician who wasn’t desperate, about to become homeless or be thrown in jail for non-payment of debts would only ever sell a piece of music to an advertiser if they actually liked the product in question. Just like John Peel used to do. He did loads of adverts but only for products and services he used himself. I even don’t really mind U2, those spokesmen for Make Trade Fair and anti-globalization selling a song to Apple for use in an Ipod commercial because I suspect they probably all own Ipods. So, fair dues. They like the product, they’re willing to put their name behind it. But what about artists who say one thing and do another? > of the capitalist machine as much as the next man. So he’s happily complicit? He says don’t do it, he does it? Which is it Brett? This leaves an incredibly bitter taste in my mouth because my problem is not that he sold a song to an advertiser for money, if he needed the money. My problem is that he then has a go at others who do similar sorts of things. He complains about the state of society but he’s not got the bottle to stand up for what he believes in and turn the money down and just tighten up his spending, sack his PA, start getting the Tube instead of taxis, maybe have one less holiday to Cuba or Rome or Barcelona or wherever. If you’re going to make anti-consumerism, and the evils of branding and advertising a central tenet of your art, is it not entirely wrong to then allow your music to be used for branding and advertising and to keep going to product launches and let your picture be taken there, thereby suggesting that you’re behind that product and are happy to have your image used on behalf of that product? Is this not in itself the great artistic sell-out? Or, am I simply taking this all too seriously, I should not expect artists to live up to their own artistic visions and I should realise that Brett is only human and out for the cash like everyone else? I hate being let down by people I respect. I hope eventually Brett will provide a decent justification for his hypocrisy beyond “Can’t get away from society, sorry.” I also hope that no more of my musical heroes fall prey to the corporate dollar and the quest for image over their own utopian vision. So, comments, criticisms folks: Should we hold artists to practise what they preach? Should they strive to live up to their own words or is it enough that they’ve said it in a song, they can then live however they please? Being crammed into the arse end of the Dry Bar at the arse end of the hottest day of the year thus far were not the ideal conditions for a gig but they were made bareable by excellent performances from Camera Obscura and, before them, François, a Frenchman based in Bristol who, joined by a couple of friends on bass and drums, played some rather nice anglo-french lo-fi to a very apprecative audience and sold many albums and cds after the gig as a result. This was the first time we’d seen Camera Obscura and they didn’t disappoint (well, they didn’t disappoint me; JustHipper was less impressed but then she’s never really sat down and listened to them before). 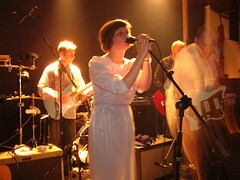 The six-piece made their way precariously onto the oddly-shaped stage, which seemed to be made up of Tetris blocks, and delivered a set with a perfect balance of newies from their Let’s Get Out Of This Country long player and classic oldies. “Eighties Fan” and “Teenager” set the standard early on and the wonderful single-of-the-year-so-far “Lloyd, I’m Ready To Be Heartbroken” was a delight thanks to Annemarie Campbell’s swooning vocal performance. Annemarie was charming throughout, handing out strawberries and apples at one point to the sopping wet punters, and her voice was every bit as good live as it is on record. Unfortunately the size and layout of the back end of the Dry Bar meant that the sound quality wasn’t as good as I would have hoped for but Kenny McKeeve’s delicate, multi-textured guitar work and Nigel Baillee’s excellent mix of percussion and trumpet gave a hint of how great they could sound in a bigger venue; I guess we have Summer Sundae to look forward to in August to find out. They saved the best for the encores with a stunning version of “Books Written For Girls” which they claimed they had not played for a while and apologised beforehand in case it sounded crap. Quite why they wouldn’t play this song every night I don’t know, it was simply beautiful and got the biggest cheer of the night by a mile. They ended, as I hoped they would, with the classic “Suspended From Class”, leaving the crowd fairly elated but probably relieved at the imminent prospect of a bit of fresh air. Tapes ‘n Tapes are the current darlings of the US blogosphere – or at least they were a couple of months ago; these things change very quickly – and this was the final date of their first UK tour, except that this was the only date that they weren’t headlining, that honour going to Vancouver’s You Say Party! We Say Die!, which meant we had to make do with a truncated set in front of a smaller than expected crowd. According to the billing Metronomy were due open but it was a very athletic-looking Tapes ‘n Tapes who came on first, though, as we didn’t really know what they looked like, it wasn’t until the first familiar guitar riff of “Just Drums”, which opens their highly recommended debut long player The Loon, that we realised it was them. It was an excellent opener that showcased Jeremy Hanson’s spidery drumming technique, and which gave you some idea as to why the bloggers on the other side of the pond were fawning all over this band when they played about 10 sets at South By Southwest earlier this year. There was a great urgency in the performance and this seemed to increase as the gig went on with muscular keyboard player Matt Kretzmann playing tuba on one track and stalking the stage thrashing on a tambourine for another. New single “Insistor” was a slight disappointment, its dynamics suffering from a poor sound mix, but the gorgeous “Manitoba” and manic “Cowbell” more than made up for those shortcomings. Time constraints meant that “Omaha” was sadly aborted after a couple of seconds and the two new tracks played didn’t make too much of an impression on first hearing, but the closing epic sweep of “Jakov’s Suite” showed what a great live band Tapes ‘n Tapes have the potential to be. A larger venue and a headlining set next time round should do the trick. I’d never heard of You Say Party! We Say Die! before this gig was announced and was sceptical about their right to be headlining over Tapes ‘n Tapes but in the end I have to say that they were excellent and gave Tapes ‘n Tapes more than a run for their money. They play hi-energy indie rock with shouty female vocals and reminded me very much of Pretty Girls Make Graves with a bit of The B-52’s thrown in, which is a pretty good combination in my book. 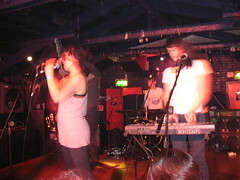 They have a very energetic live set for which this venue was far too small, so energetic that their pre-gig ritual involved rather entertaining on-stage warm-up exercises. 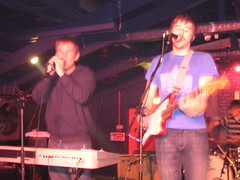 The lead singer frequently ventured into the audience while the bass player stood atop speaker stacks and wandered off the side of the stage as if to emphasise the point that they should be playing larger venues than this. Which, like Tapes ‘n Tapes, I’m sure they will be next time they come over. Metronomy were last on but the hour was late and there was work in the morning so we left. Sorry Metronomy, we’ll try to catch you next time.